Blue Man Group is bringing more family fun to school vacation week this April. In addition to the unique show experience, kids and parents alike can get creative before the show with free art-inspired activities. And, new this year, patrons can take advantage of a special discount: 25% off a Family Four Pack of tickets. With an expanded scheduled of 18 shows between April 15 to 21, there’s plenty of opportunities to see the boys in blue including added matinees throughout the week. From April 15-17, prepare to enter the Blue Man Group tribe when the theater staff offers glow-in-the-dark face painting in the Charles Playhouse Lounge before the show. Kids and adults can pick out tribal-inspired designs and glow during the performance! From April 18-21, roll up your sleeve and channel your inner Picasso when you “decorate-a-mask” using various materials like feathers, gems and special black light markers. After all performances, guests are invited to stay and meet the Blue Men and take the ultimate selfie to add to their collection. Blue Man Group Boston has also partnered with local Theater District restaurants to offer free food specials and discounts to their attendees. More information about school vacation week activities, tickets and a list of special discounts offered by participating restaurants can be found at: https://www.blueman.com/boston/buy-tickets/school-vacation-week. All activities are free for ticketholders. 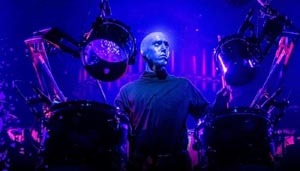 For more information about Blue Man Group Boston and the show experience, check out www.blueman.com. Children under the age of 3 are not permitted in the theatre.